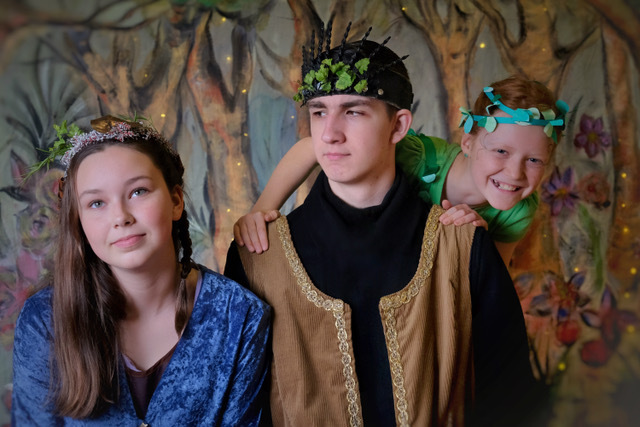 It’s a weekend of Shakespeare fairy tale fun and magic for the whole family when Ashland Children’s Theatre presents three performances only of William Shakespeare’s A Midsummer Night’s Dream, adapted by William Ritch and Fairy Revels, by Eve Smyth on Saturday, March 17th at 3:00pm and 7:00pm and Sunday, March 18th at 3:00pm at The Dance Space in Ashland, 280 E. Hersey St.
A Midsummer Night’s Dream is a one hour version of the classic tale by William Shakespeare, adapted by William Ritch. In this renowned comic play, the world of humans and fairies collide, love is lost and found, and found again! All the while these charming characters bring us laughter and delight. In Fairy Revels we are once again in a fairy filled world as sprites rehearse a play “Romano & Asiago” for their King and Queen. Both plays are directed by Eve Smyth, produced by Kate Sullivan, and celebrate the talents of Ashland Children’s Theatre actors ages 7-17.